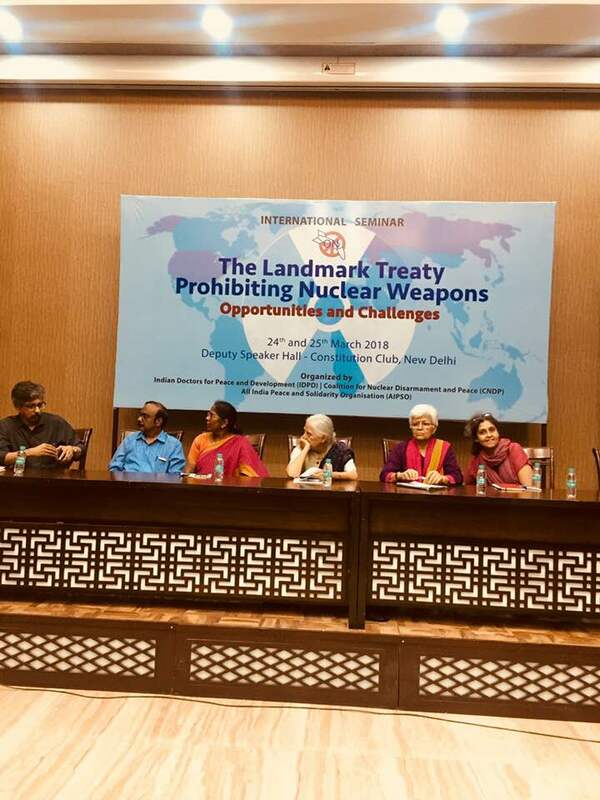 After a press conference addressed by Dr Tillman Ruff - Founding Chair of the International Campaign for the Abolition of Nuclear Weapons (ICAN) Dr Ira Helfand - member International Steering group of ICAN,an international seminar on"TREATY PROHIBITING NUCLEAR WEAPONS - OPPORTUNITIES AND CHALLENGES” was held on 24th and 25th march 2018 at Constitution Club, New Delhi. It was organised by CNDP and Indian Doctors for Peace and Development. At the conference, Kamla Bhasin, a social scientist spoke in the session on Social Dimensions of Nuclearism. Bhasin is co-chair of the worldwide network Peace Women across the Globe and the South Asia Coordinator of the global One Billion Rising campaign to end violence against women and girls. She encouraged audience participants and senior doctors to chant our Slogan for Peace and Equality. Major General (retired) BC Khanduri, former Chief Minister of Uttarakhand, Chairperson of Parliamentary Standing Committee on Defence had agreed to meet a delegation in this regard. The four-person delegation included Dr Bansidhar Mishra, Physicians for Social Responsibility (PSR) Nepal, former MP and health minister, Nepal, Dr Anindya Shams, PSR Bangladesh, Dr Arun Mitra, Co-President of IPPNW, and Dr Tilman Ruff, Founding Chair of ICAN and co-President of IPPNW. But few hours before the delegation was due to meet Gen Khanduri, Dr Arun Mitra rang his office to confirm that all was in order for our visit. He was put through directly to Khanduri, whose tone was generous and cordial – “Let’s meet and talk,” reassuring Dr Mitra that if there were any issues with us gaining passes, given heightened security as parliament was in session, we should call his office and his staff would expedite passes for us. In the meeting the delegation planned to discuss the the new Nuclear Weapons Ban Treaty that was passed by 122 votes in favour and only one against it. For the struggle by ICAN - the International campaign to abolish nuclear weapons, the ICAN has been awarded Nobel Peace prize for 2017. 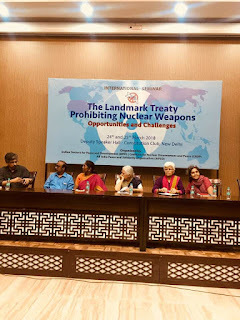 The treaty faces huge obstacle because the nine nuclear weapons possessing States including the 1) USA, 2) Russia, 3) UK, 4) France, 5) China, 6) Israel, 7) India, 8) Pakistan and North Korea chose not participate in the treaty negotiations. Unless all nuclear weapons states realized the need to save the world from mutually assured destruction, the enforcement of the treaty will remain a pious wish. It is significant that the 100 page long Nuclear Posture Review (NPR) of the USA which was released in February 2018 is dismissive of the Nuclear Weapons Ban Treaty, which opened for signature at the U.N. in 2017 saying, it "is fueled by wholly unrealistic expectations of the elimination of nuclear arsenals without the prerequisite transformation of the international security environment. This effort has polarized the international community and seeks to inject disarmament issues into non-proliferation fora, potentially damaging the non -proliferation regime. This Treaty could damage U.S. security and the security of many allies and partners who rely on U.S. extended nuclear deterrence. The terms of the Nuclear Weapons Ban Treaty also could undermine ongoing and prospective military cooperation between the United States and signatory states, cooperation that is critical to the maintenance of credible extended nuclear deterrence." Such reasoning on the part of US is not at all convincing but other nuclear weapons possessing States appear to be complicit in such an approach especially in the aftermath of the killing of Libyan leader Muammar Gaddafi who had agreed to eliminate his country's weapons of mass destruction program, including a decades-old nuclear weapons program. The fate of Gadhafi seems to have been playing a role in North Korean leader Kim Jong Un's refusal to surrender his nuclear weapons program.